Located near the heart of downtown Lutsen within easy walking distance of many town amenities. The Lutsen House is a lake front home in Lutsen, MN. The home features 3 bedrooms, 2 bathrooms, and an open living area with a lake facing front deck. 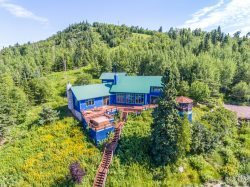 Located on a ledge rock cliff overlooking beautiful Lake Superior with a creek on one side, this could be your North Shore home away from home. The open layout living room has a gas fireplace and comfy furnishings. There`s plenty of room for everyone to gather in this living area. The large flat screen TV and entertainment area are perfect for rainy North Shore days. The living room is nestled between the sun porch area and the dining room/kitchen area. Sit back and relax in the comfy lounge chair... you may never want to leave. Wood panel walls and the stone fireplace surround add to the cabin feeling of this home. Grab your coffee in the morning and grab a seat in the sun porch to watch the sun rise over Lake Superior. You could be here. Or step out onto the lake-facing deck. There is seating for 4-6 at the dining room table and more seating at the kitchen counter. The kitchen is large and well-equipped, perfect for preparing a home cooked meal during your stay. Plenty of counter space and room for more than one chef to be in the kitchen at the same time. Two of the three bedrooms in this home have queen beds. The third bedroom in this home has a full bed. Both of the bathrooms feature shower/tub combos. The home`s deck is a guest favorite with seasonal seating, a grill, and great Lake Superior views. On a clear day you can see the rocks below the calm surface. But just wait, the Lake can be unpredictable and you could see 20 foot waves on the same day A small slope and a flight of built-in wooden stairs bring you to another highlight of this home. The firepit on the cliff`s edge - nothing but rocks between you and the Lake. Relax at the end of a long day by the firepit with family and friends, sharing tales of your North Shore adventures. The Lutsen House, as you see it when approaching from the driveway. Along the side of this easy-access one-story home. This bright and cheerful home can be yours during your next visit to Lake Superior`s North Shore. The Lutsen House is the perfect Lake Superior getaway for that special retreat - whether one couple or two, a group of friends or a family. Located right on the shoreline of Lake Superior, you will experience a sun-rise to sun-set landscape. The Lutsen location makes this special home convenient for year round outdoor activities that Lutsen is known for. This cozy home features 3 bedrooms, 2 bathrooms, a comfortable dining and living room area - complete with fireplace and year round sun room, all on one easy-access level. Outside you will find a large lake-facing deck and bbq grill, perfect for those warm summer afternoons! Head down a small slope and down the built-in staircase to the ledge above Lake Superior, where you will find a fire pit and plenty of seating for everyone to gather and share stories while enjoying the sweeping views of Lake Superior. The Lutsen House has Lake Superior to the front and a creek running to the west. There is no easy-access shoreline here, but you are perched on the ledge rock above the lake which allows for great views and ample opportunities to hear the sound of the waves crashing against the shoreline during your stay. Head out your long gravel driveway and find yourself right in downtown Lutsen, a great central location to many year-round activities. The Lutsen area offers everything from miles of hiking and biking trails to Lutsen Mountain- a recreation area offering downhill skiing in the winter and an alpine slide and sight-seeing gondola in the summer. Cascade State Park is just 10 miles away and features a gorgeous waterfall following a short, easy hike. You are also just a short drive away from several restaurants (some only open in the summer months) and quaint, locally-owned shops located nearby in downtown Lutsen and Grand Marais. After a long day of exploring the North Shore come back to your home away from home and enjoy a fire on the ledge rock. Roast marshmallows with your friends and family and reflect on your Northwoods adventures. If you came to the North Shore just to relax, then you've obviously come to the right place! Make The Lutsen House your North Shore home away from home. My first impression when I walked in was "what have I done!" I say that because there was a smell that wasn't pleasant. Not sure if it was from being closed up, but it did get better once we opened things up. The location is amazing and we enjoyed the creek and the fire pit. Getting down to those things is interesting, but that's part of the adventure. I would recommend getting your groceries someplace other than Lutsen, kinda limited. THE LUTSEN HOUSE WAS FANTASTIC!!! CLOSE TO GOOD FOOD, WALKING TRAILS, TOWNS, AND A WINERY TOO. Very pleased with the stay. After a bit of a mix-up regarding our reservation, we fully enjoyed the Lutsen House for three nights in September 2017. The location is perfect for exploring the North Shore -- great proximity to Grand Marais and all of the terrific restaurants and shopping available there. The home was furnished with plenty of towels and linens, as well as nearly everything you'd need in the kitchen. The view was amazing and the weather was perfect. The stairs to the fire pit are a bit challenging, but not impossible. It's worth the effort to enjoy Lake Superior's wonder up close and personal. We sat on rocks above the shoreline and were treated to some fresh water spray! We did not encounter any problems during our stay. We had an issue with one of the bathtub drains but Andrew took care of it immediately. I was very impressed with his friendliness and willingness to make our stay a good one. Lutsen house is perfectly located with a beautiful view of Lake Superior and at the same time conveniently located across highway 61 from a laundry, grocery store, liquor store and Cascade Rentals main office. The house is everything we had hoped for and more. The house right on the lake was great. One night we saw a big orange moon rising across the lake--quite beautiful. Restaurants in Grand Marais and Blue Fin were good eating. The general store and coffee shop right across the highway were convenient. The house is located in such a beautiful location. It was clean, well-maintained and extremely comfortable. The amenities available were excellent. Would have loved to stay longer. Just a few minor comments: - no instructions available for turning on gas fireplace. We called the number provided and resolved very quickly. - couldn't find any kitchen dish towels - pillows could be better (a bit flat and hard but my husband thought they were fine). Personal preference. - would prefer a bit later check-out than 10:00 am. We plan to come back with the family. We've stayed at multiple resorts/condos in the area and this is my favorite one so far. Thank you. The Lutsen House was very comfortable - adequately furnished - the beds were just right - a great view of the lake from inside and from the deck. The little creek became a gushing little river after an inch or two or rain on Sat night. A prior review mentioned the stairway being a challenge. Yes, we needed a walking stick to feel somewhat at ease going up and down to enjoy the firepit. (The water bucket that was supposed to hang by woodpile was not around.) Two items in the Master Bath - 1) need one or two grab bars in the shower and 2) the light above the sink should be rotated 180 degrees to shed the light downward for shaving or facial makeup use. We really appreciated how clean the rental was when we arrived, as well as many of the "extras" (starter toiletries, spices, oil, etc) that were there for our convenience. We had noticed the reviewer prior to our stay had mentioned the tub and shower drains wouldn't clear and we were pleased to see that had been addressed and fixed... We had no issue at all with standing water. As others have mentioned it really would be nice to have access to the home's laundry facilities. I can't think of the last home or condo we've rented that didn't have onsite laundry access prior to this. As noted in previous reviews, the stairs to the water are treacherous and uneven. They really not ideal for the elderly or small children. Overall, we really enjoyed our stay in this lovely home! Location was excellent, layout of cabin was very nice with an infant and 2 year old in mind. The house was centrally located for our cross country skiing. Worked well we were with two other couples so there was plenty of room for all of us. Saw several deer roaming in the yard. Very peaceful area. Dishes in the cupboards were not very clean. The Lutsen House had lovely views, was comfy, great beds, etc. The firepit on the lake with the babbling creek flowing into Lake Superior was wonderful! We will definitely recommend this lake home and rent here again. Fabulous house. Very convenient location to the store and to the slopes, and what a beautiful view of Lake Superior from the sunroom/deck.